If you’re considering cruising the Baja peninsula and, perhaps, beyond to mainland Mexico this autumn, now is the time to focus on planning and preparing your vessel for a potentially rigorous 750 nautical mile voyage to Cabo or about 900 n.m. if you’re continuing on to La Paz. Most people have some initial concerns. The first question I usually hear is whether it’s safe to travel by boat to Mexico. The answer is definitely “yes.” Arv and I go to Baja regularly, by foot to Tijuana, where we enjoy dining, and by car or boat to Ensenada. We always enjoy Mexicans’ friendliness, warmth and hospitality. Do we have qualms about our personal safety? No more so than at home. As long as you use common sense and behave normally, you are as safe as, and possibly safer, than at home. By “common sense” I mean: stay in well-lit, populated areas; always be respectful of others; don’t flash wads of cash or lavish jewelry; don’t buy illegal drugs; leave guns at home, and – most important! – comply with all Mexican laws. If you need help, flag down the special tourist police in towns or telephone the Mexican tourist assistance hotline at 078 (it’s operated by the Secretary of Tourism). If you’d like to make the trip but hesitate to go on your own, consider joining CUBAR (Cruise Underway to Baja Rally; see cubar.sdyc.org). The San Diego Yacht Club organizes this powerboat flotilla, which departs this year and odd years in early November, while Baja Ha-Ha (baja-haha.com), the annual sailboat rally, leaves in late October. Both groups still have space for this year’s cruise and both offer the camaraderie and support of a large group in making the voyage, although only CUBAR offers the benefit of mechanical and medical professionals accompanying the fleet. Both groups’ websites offer extensive information that any cruiser would find helpful in planning their voyage, including a mechanical inspection checklist found on CUBAR’s document page. 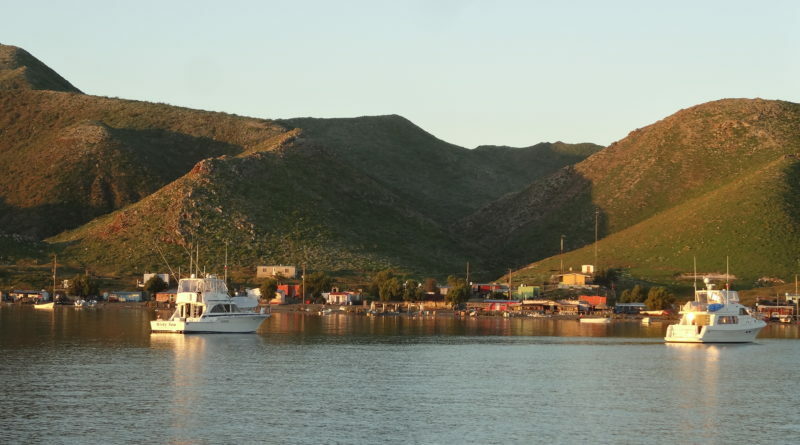 Both include informative guides to cruising to Baja, which describe how to prepare and what to expect along the way, including handling entry paperwork. Before deciding on a long-distance cruise, make sure your boat is in tip-top shape, has sufficient range for the trip you’re contemplating and can carry enough fuel and water to travel between major ports. We learned that marine (and medical) services are minimal between Ensenada and Cabo San Lucas. Cruisers need to be self-reliant, able to take care of themselves and perform any running repairs or needed maintenance to their boats. Before committing to the trip make sure you, your boat and crew are fit and seaworthy and that you understand your boat’s systems and functions well. This is not a trip for “newbie” boat owners. If you don’t fully understand your boat’s systems and their operation, make sure a skilled professional you trust carefully checks out every system, making any needed repairs. In preparing for the cruise, equip yourself generously with tools and spare parts, including all pumps, filters, belts, hoses, clamps, connectors, gaskets, etc., to repair engines, generators, watermakers, electrical and plumbing systems. Don’t forget extra duct tape, sealants and adhesives for emergency repairs! Then ready yourself for a wondrous experience you’ll never forget. ← Who’s looking out for recreational boaters’ interests? One essential piece of gear for offshore voyaging is an EPRIB and Personal locator beacon. Also consider a SPOT or Delorme/Garmin Inreach tracking device. AIS transceiver is also a very important safety gear. Offshore rated life jackets, and jacklines plus solid attachment points for harness attachment. MOB gear, and life sling are also essential pieces for offshore voyaging.